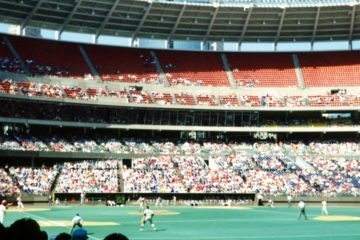 Editor: This is the sixth installment of a season-long series by our resident Reds historian, John Ring. The series will examine the 50th anniversary of the 1968 Cincinnati Reds, a team on the brink (of huge success) playing during a year that it seemed the world was on the brink. Enjoy! On July 16, 1968, the Cincinnati Reds lost to the Los Angeles Dodgers by a 9-2 score. Don Drysdale, he of the 56 consecutive scoreless inning streak, got the win. With Pete Rose on the disabled list because of a fractured thumb, leadoff hitter Alex Johnson had three hits and so did Vada Pinson. But Reds ace Jim Maloney was knocked out early and the Reds were saddled with a record of 42-45 after the loss and not looking good. They were in 6th place, 15 and 1Ã¢Ââ€ž2 games behind the first-place St. Louis Cardinals. Ã¢â‚¬Å“That didn’t go over very well. Pete [Rose] didn’t want to do that because he didn’t hit a lot of home runs. Johnny Bench said he’d keep the first 15 and then donate to the pitchers after that. But he hit 15 for the season so we didn’t get anything,Ã¢â‚¬Â laughed the former Reds righthander. Fortunately for the good guys, things would change quickly for the Cincinnati Reds after that loss to Drysdale. They went on a tear. True, they were far behind first-place St. Louis but they made a run. At the same time, America’s culture was shifting a bit too. The top-rated TV show was Rowan & Martin’s Laugh In on NBC. Stoned Soul Picnic, by the 5th Dimension, was #3 on the rock charts with fast-climbing Jumpin’ Jack Flash at #5. And The Green Berets starring John Wayne was one of the top movies of the summer. But the Reds were making a move– they won 11 of their next 13 games to finish the month of July, including one of their weirdest no-hitters ever, courtesy of Culver. Weird you ask? The game didn’t even start until 10pm (EST), in the City of Brotherly Love. Johnny Bench didn’t catch it (he caught 154 games that season) and the Reds won by a 6-1 score. So in the Year of the Pitcher, George Culver’s no-hit win over the Philadelphia Phillies is the Reds contribution to that historic season. Cincinnati’s hot-streak started with a 7-4 win over the Dodgers. Mack Jones’ two-run double and a sacrifice fly by Pinson provided the winning margin. Then, the Reds scored 37 runs in the next four games in routing Philadelphia and Pittsburgh. It was capped with a 7-6, 12-inning win over the Pirates when Bench went 4 for 6 and Pinson rapped out three more hits. Culver and Clay Carroll then combined on a 13-hit shutout of Pittsburgh in a 2-0 win. That’s right– a 13-hit shutout. Jerry Koosman slowed down the Reds by tossing a four-hit shutout (two by leadoff hitter Chico Ruiz) in a 2-0 Mets win. After New York won again by a 5-2 score, the Reds routed Tom Seaver in two innings and Carroll pitched four innings of no-hit, no run relief in a 5-3 win. Lee May homered twice in that game for the Reds. In Philly, the Reds kept pouring it on. In the first game of a twin-bill, Tommy Helms went 3 for 4 and drove in a pair of runs in a 7-6 win. And then the second game featured Culver again but it didn’t start until 10 pm because of the length of the first game. Pat Corrales, the Reds backup catcher, started that game. In the second inning, Phillies’ first baseman Richie Allen reached on an error by Perez and advanced to second on a throwing error by shortstop Woody Woodward on the same play. Bill White got him to third on a ground ball to the right side of the infield and Cookie Rojas delivered a sacrifice fly for a 1-0 Philadelphia lead. It didn’t last long. Rose, back in the lineup, combined with Helms and Johnson for seven hits at the top of the Reds batting order and the Reds zipped to a 6-1 lead. Corrales added a pair of hits and knocked in two runs. Ã¢â‚¬Å“So I go back into the clubhouse to get a beer. The clubhouse attendant said there wasn’t any left. Connie Mack Stadium was in a pretty rough neighborhood so it was hard to get a cab to get back to the hotel. By the time I did, everything was closed. I was going to go out and celebrate. Ã¢â‚¬Å“Looking back on it,Ã¢â‚¬Â added Culver, Ã¢â‚¬Å“it’s probably good that I didn’t. The Reds won their final two games of the month over Philly and Pittsburgh. That was 11 of 13. They leaped from sixth place to second. But unfortunately, the Cardinals were also on fire with a 70-36 record, the best in baseball. The Reds won 11 of 13 but were still 14 and 1Ã¢Ââ€ž2 games out. They had made up exactly one game on St. Louis. One damn game. Vice President Hubert Humphrey had sewed up the Democratic nomination as well. Their Convention was to be held in Chicago as a political promise to Mayor Richard Daley. The Democrats were splintered and angry. Robert Kennedy had been assassinated. Vietnam was a disaster. LBJ wasn’t running. There was a large, anti-war faction in the Party. There were probably a lot of Democrats hoping the Convention would be held somewhere more remote– like in Boise, Idaho. No such luck for them. Neither for the Reds. They had made a big move in the National League but were way behind the Cardinals. But there was still two months to go. Can you surry, can you picnic? The Reds were running out of time in August of 1968. Could they Ã¢â‚¬Å“surryÃ¢â‚¬Â close to first place against the vaunted defending champion Cardinals? Nixon would be in tranquil Miami Beach, awaiting coronation from the Republicans as Ã¢â‚¬Å“The Law and Order Candidate.Ã¢â‚¬Â The Democrats would be in Chicago. Mayor Daley issued orders to the police to keep order. The Mayor’s photo would be on a sticker, welcoming Democrat delegates to Chicago and attached to every hotel telephone room in the City. Protesters were sure to be in force. It was a Perfect Storm. Only in 1968. Two things, John. 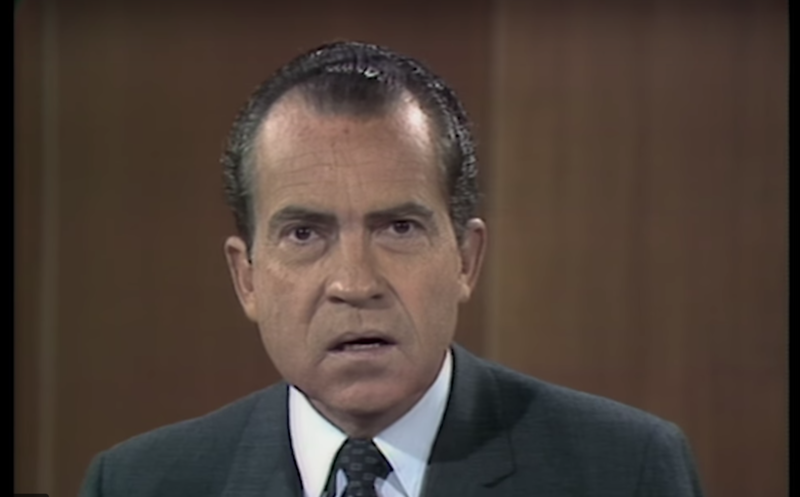 “I’m not a crook” and this article was the gas, gas, gas. I remember George Culver well. After his no-hitter in Philly, the Reds held George Culver Night at Crosley Field and I was there with my Dad and brothers. They gave away a photo of Culver’s final pitch of the no-no(wish I still had it!). The Reds gift to Culver was not a car, a boat or a motorcycle, but a cow! Evidently, he was a farmer. Wonder what happened to the cow! I remember how no one could figure out how Mays was the MVP of that game. Should have been Helms – although it had to be the most boring AS Game of all time. The other thing(besides George Culver Night) that I really remember about that team was Alex Johnson. . .He could really hit, but he had to be one of the worst outfielders of all time. Watching him play the terrace at Crosley was worth the price of admission!